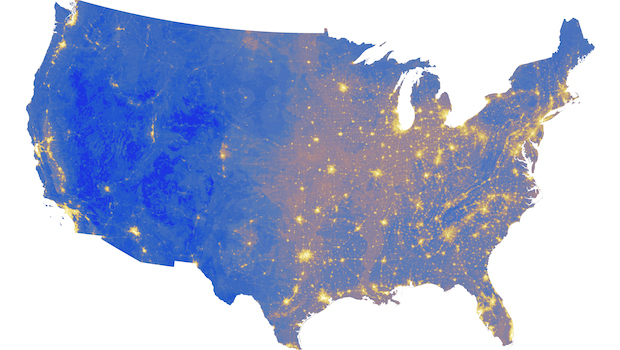 Map shows loudest and quietest spots in U.S.
One of the great things about spending time in nature is what isn't there. The lack of noise. The lack of lights. And this is what the National Park Service tries to preserve. To that end, the NPS's Natural Sounds and Night Skies Division works to keep "acoustic and night sky environments unimpaired for the enjoyment of future generations," senior scientist Kurt Fristrup told CBS News. The Natural Sounds project is creating an inventory of sound, taking long term noise measurements at 546 sites across the country, a total of 1.5 million hours' worth. By combining these samples with information such as latitude and longitude, time of day and year, climate and moisture levels -- wetter, more vegetative areas tend to be noisier than deserts -- NPS researchers have created a comprehensive map of sound levels from coast to coast. In the map (shown above), which was presented this week at the annual meeting of the American Association for the Advancement of Science, the bright yellow areas around places like New York City, Los Angeles and Dallas represent noise levels of 50 decibels or more. Meanwhile the darkest blue regions, such as in Yellowstone National Park in Wyoming, are the quietest, staying below 20 decibels. Now the hard part: to keep these spots as quiet as possible. Moves such as favoring quieter electric vehicles over noisy gas guzzlers will help NPS to protect wildlife from the noise pollution of humans and to maintain the pristine quality of our national parks. "Unlike many other forms of environmental degradation, sound and light offer opportunities for rapid improvement," Fristrup said.